It’s great to see Newbold rediscover some of their early season form and secure a bonus point win against traditionally stubborn opponents, Hereford, writes Sean O'Brien. 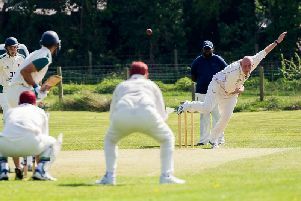 Newbold started well and were playing with real pace and quality handling on a dry bright day. Curtley Bale in particular got around the park really well, adding lots of handling and tackling to a very good game in the tight. Kyle Furlong was outstanding in defence and made a real pest of himself at the breakdown. He also scored the first try of the match when, after Joss Thompson stole a lineout in Hereford’s 22, he spotted a gap and went through. Dan O’Brien, returning for the first time after being hamstrung for a month, converted. Ben and Sam Thompson burst through to set up a lovely try on the left wing for the dangerous Manny Sidhu. O’Brien nicely struck conversion matched a few nicely struck long touch finders to provide vital field position for ‘Bold. Newbold let Hereford back in in the second quarter though, and it took a couple of lung-busting Phil Reed cover tackles to keep them out. Hereford did combine to score soon though, for 14-5. Josh Cooke looked really good when he came on to replace Ed Scott. Josh scored wide on the left after making the original bust in the same move, down the right hand side. Sam Thompson’s flick-on was the highlight of another good game from him. Dan O’Brien made the conversion look easy, 21-5 at half time. Newbold just seemed to do everything slower in the second half, and despite camping in Hereford’s half, they struggled to bother Terry Andrews too much, who was on scoreboard duty. It was great to see ex-President Arthur Spooner running the line on his 70th birthday. George Jarman made his first team debut. Not bad for a lad who turned up for colts training out of curiosity just three or four years ago. A great story, well done George. Hereford injuries led to uncontested scrums, and this disrupted the flow of the game in the second half, which didn’t have the thrills of the first half. From a five-metre scrum in the clubhouse corner Sam Thompson picked and went, passed to Phil Reed who slipped an inside pass to Ethan Wookey, who must have been top yard maker on the day, to finish well. The final score was 26-5 then, which felt about right. Third in the league looks the likely outcome of this enjoyable season, unless Dudley Kingswinford have an absolute disaster of a result in one of their final three games.